Game Overview: The game is set a year after the Apollo Justice game. 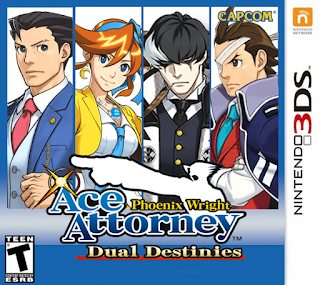 In this game you play as Phoenix Wight, Apollo Justice, and Athena Cykes. The game play is split into investigation section where you get to search for evidence and interview witnesses and into trials where you cross-examine and use evidence to win your case. 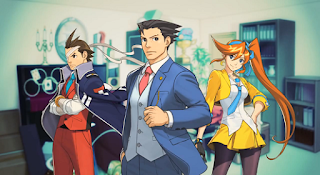 Phoenix Wright sees when a witness is hiding something, Apollo Justice spots visual tells when a person is lying, and Athena Cykes can detect conflicting emotions in a client’s voice. You use these techniques and more to learn the truth and ensure that you client is not found guilty. Fangirl Thoughts: The thing that I enjoy about all the games in this series is that there are connections that start to present by the time that you get to the last story. I like that the games constantly bring back old characters and that as you go from game to game you truly get to know and understand the characters. I personally did not play Apollo Justice and I know that I need to back track and play it because it is actually very central to the game and future games. I wrote it off as a spin-off but in reality it is very much a part of the central story. This game finds the characters dealing with some major events that affect each one of them in some way. The ending was a true surprise once I realized where the cross-examination was going I will admit that I said “omg”. I tip my hat to the ones who wrote this particular story because I did not see the evil coming. If you enjoy logic and puzzle type games then this is the game for you. It was a great installment in the series and I would recommend it.